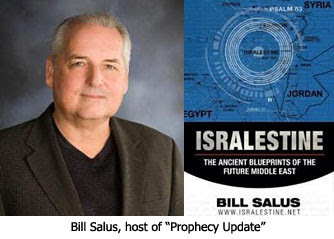 Bill Salus: Let's assume that a prophetic fulfillment of a Psalm 83 war where Israel subjugates their hostile surrounding neighbors and becomes a Greater Israel occurs and the Church is still here. How could that be a witnessing tool for Christians who understand that prophecy, seeing it play out before our very eyes on FOX and CNN and other news networks. Wouldn't that be a great witnessing tool? We have so many signs of the times occurring right now showing that Jesus is coming back really soon. We have an arsenal of signs of the times that prove that. And yet, many Christian are like, "What will be, will be." They are not paying attention. But, when we see things heat up in the Middle East and then can point to Psalm 83 or your book which explains well a Psalm 83 war, we can say, "Look, this is prophetically going to happen and we are in it right now." A fulfillment of Psalm 83 in our lifetime would be a major prophetic resource in which to open people's eyes to the Bible and to God's promises. Bible prophecy is so wonderful because it gives us an urgency to want to share the Gospel. I think if people see Bible prophecy being fulfilled right before their eyes they will get excited. As a matter-of-fact, we certainly have Bible prophecy being fulfilled this very day with Israel coming back into the land and being regathered from all the nations, which is the beginning process for the last days (Isa. 11:11-12; 66:7-8; Ezek. 37:21-22; Zech. 8:4-8). Bible prophecy makes us excited that we are living in a time where God's will and God's promises are coming together and culminating. The Rapture is yet another exciting part of God's plan because as nice as this Earth is, I am anxious to get to Heaven in my glorified body and begin whatever work God will have for me there. Maybe God will let me garden in peace, I don't know. I want to just be with our Lord, be with my Savior. Bible prophecy being fulfilled means Jesus' return is close. It gives us an opportunity to live holier lives. We live in a time when we need to get serious about our Christianity. As a parent, there are times when I see that look occasionally when I come home or I go into one of my kids' rooms and find they aren't doing something they should. They look up real quickly and their faces show, "Oops, you caught me doing something I shouldn't be doing." I don't want God coming back and seeing me making that same face. Bill Salus: Let's conclude with some comfort. You mentioned earlier John 14 as one of the Rapture passages. It says, "Let not your heart be troubled." Is that correct? Is that something you believe connects with, "Don't let your heart be troubled. You believe in God, believe also in me." Jesus is saying this, "In my Father's house are many mansions, if were not so I would have told you. I go to prepare a place for you. And if I go and prepare a place for you I will come again and receive you to myself that where I am there you will may be also. And where I go you know and the way you know." Nathan Jones: God made the Creation in only six days and then He rested on the seventh. Since Jesus was resurrected, He has taken 2,000 years to build the New Jerusalem, so it must be beyond belief. I envy the Apostle John for being able to go see it early. When we talk about the magnitude and size of it - wow! I just read an article recently where the preacher goes into calculating the dimensions of how big this city actually is. And so, we know that we have a wondrous new place to live where Heaven and Earth will meet one day. The best part about our future is that we get to be with our Savior — forever! This is the guy who died for us, the guy who loves us, the God who made us, and we get to spend an eternity with Him. We don't have to worry about crime and sin and death and sorrow anymore. We will have perfect relationships. I get to stop screwing up in my sin nature and be made whole and complete again. There is a lot to look forward to, and that gives us a lot of hope. Bill Salus: Speaking about the New Jerusalem, in Revelation 21 there is some description given. It says in Revelation 21:15, "It was measured with a reed and it was 12,000 furlongs in length, width and height and they are all equal." I had done some math on this once upon a time and those dimensions laid out would reach across American from San Diego in Southern California, all the way up to Seattle up the West Coast, stretched all the way from the South over toward the Houston area in Texas and equally and if you went square with it all the way up right up into Montana somewhere parallel to Seattle. We are talking about a pretty huge place! And so, we need to be prepared. The hour of trial that is coming upon the Earth is coming soon. You can be fully equipped with your hope in Christ because at the end of 1 Thessalonians 4:18 concerning the Rapture the verse says, "Therefore comfort one another with these words." Just speculating...with an entire universe of planets out there, I'm hoping we go exploring in our glorified bodies (no need for spaceships). hartdawg said... "...i dont see how we can have more than 5, maybe 10yrs left at the most." Yeah! It really does seem like it!... I've been doin' this every year after year since the early 70s, when I 1st starting paying attention..., the formation of the EU project..., China's Prez Mao boasts that he can field a 200 million man army [exact same # given in Rev. ]..., Hal Lindsey's impact with "Late Great Planet Earth"..., Etc... Can't be "...more than 5, maybe 10yrs..."
"...about to be hit by a Salami!" the statement i added is from time to time God pushes back the prophetic clock. having said that, this time i dont know. it seems unlikely he will but its as you said "the Lord is patient not willing that ant should parish..."
Salami sandwich! :D hehe wheeze! I have a Fiat Punto - diesel. Hubby has a Nissan 350Z – unleaded. Two Fiat Punto Multijet vans – diesel and a Ford Flatbed –diesel. Now retired, one van and the flatbed will be sold but are presently used by sons. Then of course there is road tax and insurance on top. "I have a Fiat, ...Two Fiat..."
And you do hand brake turns too? - Yer a lot wilder than I would've thot! Ifn ya means ‘Antonio Romero’ me Fiat has had a recall to change a nut! :D Seems the steering could be dodgy? Which brings me to the other subject - ya daft date, me, do handbrake turns – only in my dreams! It’s a theory I have nurtured in case Chicken Galore is waylaid by villains while collecting her pension, I may have to exit sharpish to out run em! Dodgy steering doing that caper could have put me in the ditch, don’t ya know! Why are we talking about rapture theory when that is not written in the Bible. Read Lord's prayer, it says "Our Father who art in Heaven hollowed be thy name. [Thy Kingdom come on Earth as it is in Heaven....]. we are not going to new Earth. God created this Earth to be inhabited and God will dwell in Jerusalem when he returns to Earth on 7th Trump.